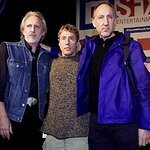 The Who's Roger Daltrey and Pete Townshend attended a National Press Club luncheon on November 12 to announce the launch of Teen Cancer America. Teen Cancer America is the US affiliate of the UK’s Teenage Cancer Trust. TCA aims to set up units in hospitals and medical centers in the US to cater for the needs of teenagers suffering from cancer. To read a full account of the luncheon, click here.